The Devilled Prawns of the Portuguese Eurasian community. How do I know? Where did I pick up making Devilled Prawns Portuguese Eurasian style? From my Eurasian friends. They and me. We have been friends for the longest time and one of them handing over her recipe for devilled prawns. Quite a long list of ingredients and me, tweeting the originally of the recipe and I must stress that the master key for devilled prawns is the spice paste. Of course, the rest of the ingredients as well. Devilled Prawns. Exciting. Vibrant. Appealing. Tantalizing. Succulent prawns in various role play of tastes, thick spicy and full of aroma gravy. When oil is heated, saute onion. 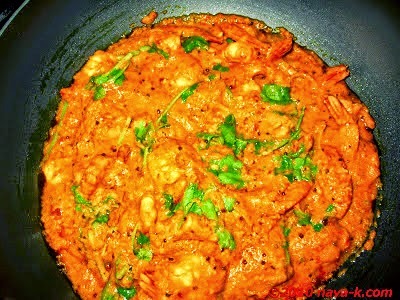 Add spice paste, fry over low heat till aromatic and oil splits. .
Add prawns, season with salt. Stir and simmer, to cook prawns. Combine in crushed mustard seeds, vinegar, Worcestershire sauce and coriander leaves.